The hashtag has taken off on Twitter with Londoners saying it sums up how they feel about religious extremists. POLICE IN LONDON today are investigating a terrorist attack at a Tube station during which one person was stabbed in the neck and two others were injured. 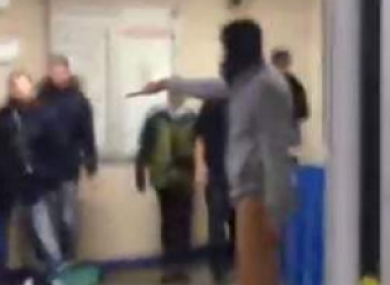 Video footage of the incident shows a man wielding a large knife shouting he is doing this “for Syria”. He was tasered by police officers and arrested. In some of the videos online, a bystander can be heard shouting “You ain’t no Mulsim, bruv” at the attacker. His statement has taken off since footage emerged, with many Londoners saying it sums up how they feel about Islamic extremism and attacks over the last few years. The sentiment behind his words is that terrorists like this man, claiming to carry out these horrific acts for their religion, do not represent the majority of Muslims. #YouAintNoMuslimBruv this is the best trending topic ever. There has also been a lot of praise on social media overnight for the police officers who managed to disarm and detain the attacker using only a taser. The counter-terrorism unit in London is now investigating the incident. Though one man sustained serious injuries in the attack, they are not thought to be life threatening. Two others sustained minor injuries. Britain’s national terror threat level was raised in August 2014 to severe, the second-highest of five levels, meaning an attack is considered highly likely. Email “Londoners respond to Tube station terrorist attack with #YouAintNoMuslimBruv”. Feedback on “Londoners respond to Tube station terrorist attack with #YouAintNoMuslimBruv”.